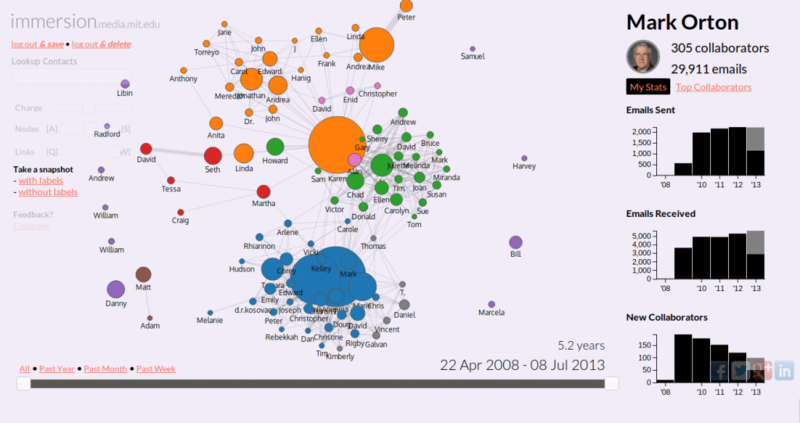 Now three fellows at MIT have provided us with a web tool to visualize metadata from our own lives. If you have a Gmail account, you should trundle over to Immersion and take a look at your own metadata. I have been using my Gmail account as my main email system for a number of years. There are four other email addresses connected to it so the graphic below presents much more than just my Gmail email address’s activity. Keep in mind that the Immersion site offers a great deal of interactivity. You set sliders to see different chunks of time, pick out particular people and see how they connect to others, and much more. There are three mysterious sliders on the left, “charge”, “node”, and “link” that change the organization of the chart. I have been unable to determine exactly what they do and the MIT guys have, to my knowledge, provided no explanation. Perhaps in their cocoon on Mass Ave, they assume that everyone will know or immediately intuit the uses of these sliders. In my case it was very easy to identify the basic clumps of my life: family and friends, Hudson business community, and the library. Then you might notice floating around the periphery are a lot of nodes without links (or only occasional ones) to anyone else. These are my clients. I don’t email most of them very often. And, excepting a referral by me for some specific business purpose they never know about the existence of others amongst my client base, therefore no links between them. Now, having played with this a bit one gets a much more visceral sense of how important and useful metadata is. And, imagining a pool of metadata that adds telephone contacts, location data from cellphones, text messages, Facebook, LinkedIn, and financial transactions, it is easy to see how fine grained and comprehensive a picture could be constructed. So, as noted in an earlier post, NSA Vacuuming, Meta Data, Mistaken Misleading Metaphors, the government is being disengenuous, to be mild, to describe metadata as only metadata. Here is a view of my data for just the last year. 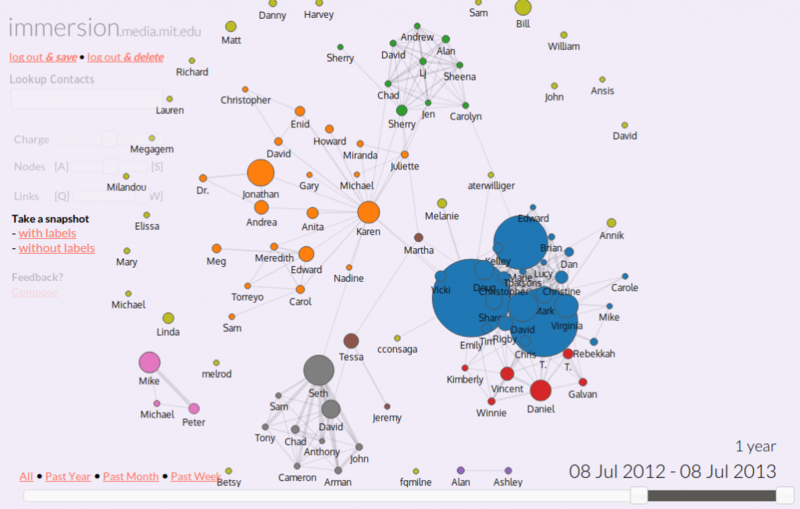 Some people have disappeared, new ones added, and the shape of the intensity of the interactions changed.